The Ministry of Natural Resources fired back today against allegations that its former Chief Executive Officer, Beverly Castillo, has been involved in a scheme to defraud a Belizean-American, Bernadette Pickwood, of land to give to her (Castillo’s) mother and son. In a statement issued today, the Ministry of Natural Resources maintained that it followed the right procedure before forfeiting Pickwood’s lease (No. 253/1989 in Belama). However, Pickwood’s attorney, Audrey Matura-Shepherd, and her brother, Bernard Pickwood, told the media today that the forfeiture was not legal, as the required notice had not been given to the leaseholder. “This is the crux of it: Was Bernadette Pickwood given this notice and reasonable time to address it? And we are saying no!” Matura-Shepherd said. In an unusual disclosure, the Lands Department today made public Pickwood’s rent statement, which claims that as of January 2013, she had $720 in arrears, accrued because she had not paid rent on the land she received. However, Pickwood’s brother explained that his sister had a genuine misunderstanding of the arrangement – believing that payments to the Belize City Council covered all required payments. He said that when he went to rectify the problem, the Lands Department—which is claiming that Pickwood had not paid a penny, accepted the payment, but he also found out about a proposed sale price for $800 to Maud Williams, the former CEO’s mother. When we contacted Williams on Monday, she declined comment, apart from telling us that she has title for the property in question. Today, Pickwood’s brother questioned how Williams could hold title for something they had not yet purchased. He went on to allege collusion at the Lands Department to defraud his sister, even after she has invested tens of thousands of dollars to develop the property. In its statement today, though, the Ministry of Lands said that Pickwood was to pay $45 rent annually on the 30-year lease, as of September 7, 1993, and one of the covenants of the lease was that it would be void if the lessee failed to occupy the premises within 6 months. Another condition of the lease was that “a minimum value of $45,000 had to be constructed within 3 years, to avoid breaching said lease agreement,” the Ministry added. It went on to say that land rent records showed that no payment of rent was paid for the land since 1993—a clear violation of the lease agreement. 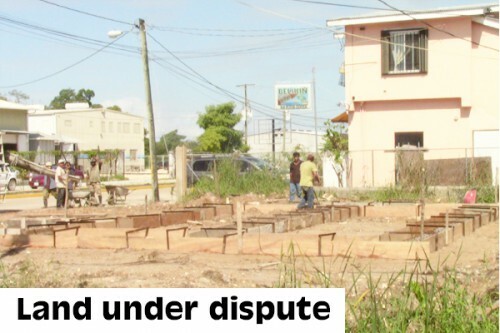 “Payment of property tax to the Belize City Council is separate and distinct from the payment of land rent as per lease agreement,” it added. Of note is that the property in question had also been mortgaged to the Belize Bank. Today, Matura-Shepherd said that not only did her client not receive notice of the forfeiture—neither did the bank. It goes on to say that on January 25, 1995, notice was sent to Bernadette Pickwood, informing her that the lease would be cancelled for failure to comply with the condition requiring development of the land. To avoid the cancellation, the breach must be remedied within 3 weeks, the official statement said. The Lands Department did not cancel Pickwood’s lease, but on October 1, 2013, a second notice of intent to forfeit was issued to Bernadette Pickwood and copied to the Belize Bank, said the ministry. Apart from contending that no notice was issued to the leaseholder and the bank, Matura-Shepherd also said that nothing was published in the Government Gazette, as is required. “In law, there hasn’t been a valid forfeiture and if there is no valid forfeiture there is no way [the Lands Commissioner] could say that on the 5th or the 6th of November … that they have actually issued a new lease. It would be next to impossible, because it would mean that he is admitting that they are breaking the law, and we need the proof that they are not breaking the law,” Matura-Shepherd said. It added that on November 1, 2013, the lease was officially forfeited, and on November 6, 2013, Lands Minister Gaspar Vega approved a transfer of the lease to the same parcel in favor of Maud Williams and Marvin Castillo, Jr.
“If that is true, we have reason for concern, because it would mean reallocation would have been done before notice to my client,” Matura-Shepherd said. “We can settle the matter but as long as they push back, we will push back!” she said. Chief Justice Kenneth Benjamin has issued an interim injunction in favor of the Pickwoods, barring the new leaseholders from continuing works on the land – which they recently commenced.